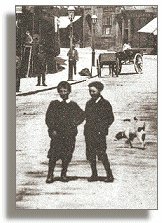 This part of our website gives some idea of everyday life for children who went to local schools in the later years of Queen Victoria's long reign. They use entries from the official Log Books or diaries of local schools. Although some schools were opened at much earlier dates, official records did not have to be kept by most until 1863, and many of the oldest have not survived. The Log Books can often tell us quite a lot about home life in those times as well as about the routine of the school itself. Too cold, too dark ! Sewing and knitting - for boys ! Sent home to wash - again ! Back to school - at night !